Reshaping the lives of humans How close is today's technology in catching up with the human body? 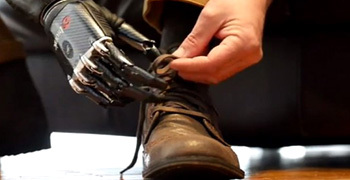 Roboticists are on a quest to find out ..
Bionics - Truth or science fiction? Thirty plus years ago Bionics was just a part of science fiction. Today, it might just be possible. If any of our visions of technological revolution come true, its none other than “Bionics”. Every year, the discoveries made are having profound effect on the lives of people all around the world. If we look at some interesting examples regarding Bionics, 30 years ago, the potential for deaf children to communicate verbally was greatly diminished. Now with bionic ears and educational support, people with even a profound hearing loss can speak clearly and confidently. Bionic eyes have already restored basic sight for people with certain conditions, artificial limbs now became a reality and other advances are now on the horizon. We are living in a technological new world, one that brings hope to those who through birth or by accident have lost function to parts of their body. Not only in defense forces people suffer from loss of limbs but this can happen anywhere to anyone as a result of accidents and illnesses, thus making the life of the person miserable. Today, bionics has progressed to an amazing level and has truly improved the lives of many people. Thanks to the staggering technological advances being made in the field of bionics, future amputee (a person who has had a limb amputated) will move with the same ease as everybody else. Now that's science fiction worth believing! Technology that is improving the lives of amputees Today, bionics has progressed to an amazing level and has truly improved the lives of many people. Bionics is the study of mechanical systems that mimic the functions of living organisms or parts of living organisms. It is also known as bio–inspiration which is the application of biological methods found in nature to design engineering systems with modern technology. Evolution forces living organisms including flora and fauna to become highly efficient. This biological efficiency of organisms to survive against all odds is an inspiring source for origin of bionics. Bionic models are based on adapting natural methods of manufacture and mechanisms found in nature. By studying organizational principles and from the social behavior of organisms mechanical systems are built. These models are not an attempt to copy nature, but an effort to understand its principles and use them in technological applications. Historical roots of bionics take us back to the time of Leonardo da Vinci. The definition of bionics as modern research discipline was given 15 years ago. From the times of the ancient Egyptians, prostheses were created to function for their appearance and used as a psych-spiritual sense of wholeness. It was then defined as research discipline that deals with systematic transfer of constructive process and evolution principles of the living systems into technical applications. This includes interactions between bio-systems and their environment. Stages of building bionic systems. 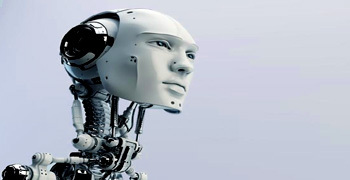 The transfer of technology between lifeforms and manufactures is according to proponents of bionic technology. There are three stages of building Bionic systems. The first stage involves – knowing the activity of organisms i.e., extracting information by observing the significance of specific activities of the organism. 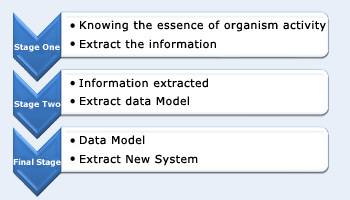 The second stage includes transferring the information into data and the final stage establishes the data model. Burrs – Velcro. 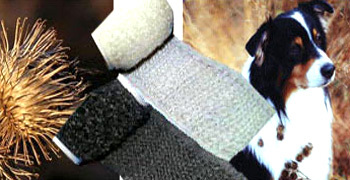 Velcro was inspired by the tiny hooks found on the surface of burrs. Hulls of boats imitating the thick skin of dolphins.This is the example of bio-mimicry. It is an application of methods and systems found in nature to the study and design of engineering systems based on modern technology. By imitating information system of organisms - how they restore, extract, transfer and sense - we can create new information systems. Velcro was invented by a Swiss scientist George da Mistral after realizing how the hooks of the burrs clung to the fur of his dog after a walk. Bullet proof vest was transformed from the tenacity of cobweb. Based on his observations such as bird flight, Leonardo da Vinci produced novel engineering designs that included flying machines and even helicopter. Morphing aircraft wings that change shape of wings based on speed and duration of flight mimic the mechanism used by a species of birds that have different shaped wings according to the speed they fly. Some paints and roof tiles are designed based on the mechanism of the lotus leaf surface to be self–cleaning. 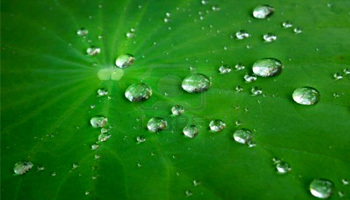 The leaves of lotus plant not only repel water but also clean themselves. No dirt or mud can stick on it. The paint that provides super hydrophobic surface and dirt particles can hardly get a hold on them and are, therefore, removed by rain or by a simple rinse in water is known as self cleaning – lotus effect paint. The paint when applied to the exterior wall of the building, not only provides a new look always but also keeps the building water-proof by repelling water by its super hydrophobic nature. Based on the physical structures in gecko's feet, medical adhesives and Nano–hairs have been developed. Hulls of boats imitates the thick skin of dolphins. Sonar, radar, and medical ultrasound imaging imitates the echolocation of bats. By imitating functions such as orientation, navigation, move control and feedback regulation of organisms, we can create new control systems. Examples: In the field of computer science, the study of bionics has produced artificial neurons, artificial neural networks, and swarm intelligence. By imitating organisms' catalytic actions, synthesis, and energy transformation, we can create chemical products, and develop chemical technology and new energy. A classical example is the development of dirt- and water-repellent paint (coating) from the observation that the surface of the lotus flower plant is practically unsticky for anything (the lotus effect). This as also been covered under Information bionics. Thus, we can know that the methodology of bionic design is based on the idea of organisms characters. Termite mounds - East Gate Center at Harare Bionics is a new science that studies nature's models and then uses these designs and processes to solve human problems. By imitating the mechanical structure and principles of organisms, we can create new mechanical systems and structures. Termite mounds include flues which vent through the top and sides, and the mound itself is designed to catch the breeze. As the wind blows, hot air from the main chambers below ground is drawn out of the structure, helped by termites opening or blocking tunnels to control air flow. 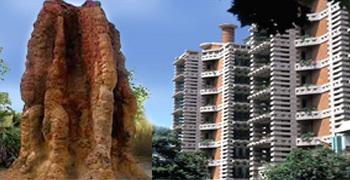 East Gate center (shopping center and office block) at central Harare, Zimbabwe is modeled on local termite mounds and is ventilated and cooled entirely by natural means. Portland based architecture firm used biomimicry concepts in some of their designs to design building ventilation, lighting, and insulation. Swiss Re building in London is built similar to the structure of sea sponge where shafts in the gaps of each floor naturally ventilate the building. North Carolina based 'Columbia Forest Product companies' product Pure Bond Soy based adhesive is an off-sited example. This adhesive was developed taking example from the humble mussel. (The proteins secreted by the mussel helps it to cling to the rock, against the force of pounding surf). Biochip implants Will the biochip implant make possible the surveillance and tracking of people by ground sensors and satellites in the sky, linked together with a massive, super-computer system? Bionics is applied in architecture, medical, industrial design and material science etc. In medicine, Bionics means the replacement or enhancement of organs or other body parts by using mechanical versions. Bionic implants differ from prostheses by mimicking the original function very closely, or even surpassing it. The structural and functional principles of organ systems in living things are analyzed by bionomists and then the principles are applied while building useful artificial systems and machines. Popular science fiction works featuring super human power by electromechanical implants will soon become reality. They will be composed with bionic limbs, bionic eye and cochlear implants. Gene Chip DNA Chips, Genome Chips, Bio chip, and cDNA arrays are all similar terms for one the most incredible and influential technologies in the area of genetic research known today — the GeneChip micro-array. These micro-arrays allow scientists to perform genome wide experiments in a fraction of the amount of time it took even just five years ago. 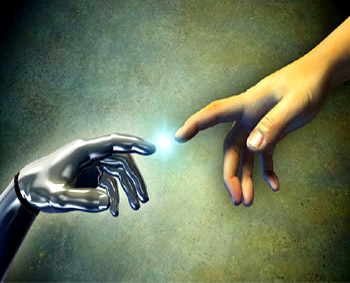 Connecting Machine and ManConnecting the artificial skin with the human nerve system will be a very challenging task. Biochips: Biochip implant is a small (micro) computer chip, inserted under the skin; it consists of a transponder and a reader or scanner Radio–frequency identification system for identification purpose. Transponder: A transponder is a passive device consists of a microchip that activates by sending low–power electrical charge. Scanner: It displays the activation code in the microchip which is different for different chips. Gene Chip: It is nothing but small DNA segments chemically synthesized. The cells made on Quartz surface can hold DNA from a different human gene. For example, a patient with a sore throat could be tested with a gene chip in order to identify the source of the infection and its antibiotic susceptibility profile. Electronic Senses: "Electronic sensing" refers to the capability of reproducing human senses using sensor arrays and pattern recognition systems. These can be used to detect poisonous and obnoxious odors and can provide quality control for different food stuff. Electronic Tongue: The electronic tongue is an instrument that measures and compares tastes like human receptors. 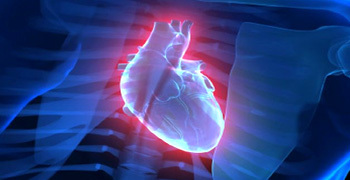 Artificial heart replaces the biological heart. It may surprise some that while there's been a growing multitude of thought-controlled bionic arms and thought-controlled bionic hands on the market for some time now for amputees. Improved life with a Bionic handThe challenges associated with replicating the movements and grips of a human hand are immense. Touch Bionics enabling a new age in human prosthetics. Artificial heart: It replaces the biological heart. In early 1980s Dr. William De Vries implanted the Jarvik–7 artificial heart into several patients wherein one patient survived 620 days. Heart–lung machine and the mechanical heart are the two types of artificial–hearts. Bionic Ear: It is an electronic device that provides a sense of sound. Electrodes implanted in the cochlea stimulate auditory nerves which will help in hearing. In this implant tiny wires are inserted to the cochlea and a microphone is fixed to the skull. 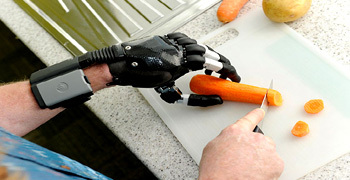 Bionic Hand: It has multi–articulating joints that are hook like, simple to open and close. They also have power to hold things. Bionic limbs allows rotating, bending, opening and closing in some instances. Man can lead truly improved life with the aid of bionics that has progressed to an amazing level. Bionic Leg: It performs the task by receiving data from sensors, sends commands to motor of amputee. Sensors in the device and inside the shoe detect user action (for example, sitting, standing, climbing stairs). Device provides external force to supplement muscle strength. Microprocessor in the device analyze the information. 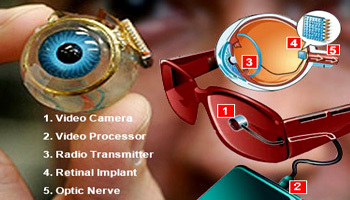 Bionic Eye: Bionic eye can provide sight – the detection of light, to the people whom have gone blind due to the macular degeneration ( a medical condition which usually affects older adults and results in a loss of vision ) and retinitis pigmentosa (degenerative eye disease that causes severe vision impairment and often blindness ). Photoreceptors of the eye are damaged in both the disease. Let&apos;s have a look what actually a bionic eye is. Bionic Eye Bionic Eye provides sight to the blind. How does a “bionic eye” allow blind people to see? A digital camera built into a pair of glasses. A video processing microchip built into a hand unit. A radio transmitter that wirelessly transmits pulses to implanted receiver above the ear or under eye. A radio receiver for sending pulses to the retinal implant. A retinal implant with an array of 60 electrodes on a chip. This entire system works on battery with video processing unit. After capturing the image Eg–tree in the form of pixels, the camera sends this image to the video processor. The function of the video processor is to convert the pattern of pixels into a continuous electrical pulses and send them to the radio transmitter on the glasses. These pulses are transmitted in radio form to the receiver under the subject&apos;s skin, by radio transmitter. The receiver sends the pulses to the electrode array at the back of the eye. The array acts as an equivalent of the retina&apos;s photo receptors. The pulses stimulate the electrodes. The electrical signals generated by the stimulation of the electrode, travel as neural signals to the visual center of the brain. Thus, the problem of macular degeneration and retinitis pigmentosa, can be rectified by bionic eye. By bionic eye, the optical-neural pathways function similar to that of healthy eye. The brain interprets the signals as tree and tells the subject–You are seeing a tree. In the next few years bionic research in the biomedical industry will lead to big technical advancement with allocated huge funds from governments. Bionic limbs, bionic retina, BrainGate (a program that decodes and translates brain waves into computer commands) are some of the bionic applications till date. Within no time bionics will solve great challenges to make bionic limbs ‘FEEL’ that creates sense of touch, hot and cold as well as sensitivity to pressure. With the staggering advances that are being made in the field of prosthesis, future amputees will run or walk down the street like everybody else. Within no time bionics will solve great challenges to make bionic limbs 'FEEL' that creates sense of touch. London&apos;s Bionic Man, named Rex Closely Mimics Our Biological Systems. It will soon be realized that the future technology will gain atleast a part of their innovative potential from inspiration and ideas found in nature for example A bionic man, named Rex complete with artificial organs, synthetic blood and robotic limbs has gone on display at the Science Museum in London. He walks, he talks and he has a beating heart, but he's not human — he's the world's first fully bionic man. The man – who is called Rex – can sense objects in front of him with retinal implants and cochlear implants to allow him to hear. He incorporates some of the latest advances in mechanical limbs, as well as a heart and lungs, an artificial pancreas, kidney, spleen and trachea, and a functional blood circulatory system. All of his components could theoretically be welded to a human body to replace missing or worn out parts. Bionics bring nature wisdom not only to physical design but also to manufacturing process. Janine Benyus, Science writer, said that "The more our world functions like the natural world, the more likely we are to endure on this home that is ours, but not ours alone."